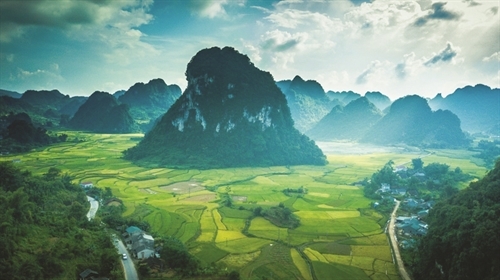 Covering 6,703 square kilometers, Cao Bang province is located in the northeastern border area of Vietnam and the Viet Bac region which consists of Ha Giang, Tuyen Quang, Cao Bang, Bac Kan, Thai Nguyen and Lang Son provinces. It borders Guangxi province of China to the north and northeast with a borderline of 333 kilometers, Ha Giang and Tuyen Quang provinces to the west and Bac Kan and Lang Son provinces to the south. It has a population of around 520,000 and is home to 28 ethnic groups with the Tay being the most populous followed by the Nung, Dao, H’Mong, Kinh (Viet), San Chay and Lo Lo. It has a provincial city with the same name and 12 districts of Hoa An, Quang Uyen, Phuc Hoa, Tra Linh, Thach An, Nguyen Binh, Bao Lac, Bao Lam, Trung Khanh, Ha Lang, Thong Nong and Ha Quang. More than 90 percent of its land is forest land, limestone mountains, rivers and valleys. According to the 2013 figures, Cao Bang has 533,384 ha of forest land, mainly natural forests that are home to 27 flora species listed as threatened in Vietnam’s Red List and 196 fauna species. At present, the province is home to the Chu Trinh industrial park, De Tham industrial cluster and Cao Bang border-gate economic zone, which was established after merging three border gate economic zones of Ta Lung, Tra Linh and Soc Giang under Prime Minister Decision 20 of 2014. According to a recent report of the provincial People’s Committee, the province received one investment registration dossier from a Chinese investor with a registered capital of USD 10 million in the third quarter of this year. Cao Bang has so far attracted 13 foreign direct investment (FDI) projects with a combined registered capital of USD 22.3 million and VND 618 billion and nine out of those FDI projects are located in the Cao Bang border-gate economic zone. More than half of the projects invest in trade and services. Because of its geological position and poor infrastructure system, Cao Bang faces a lot of difficulties in attracting FDI, according to the provincial People’s Committee. 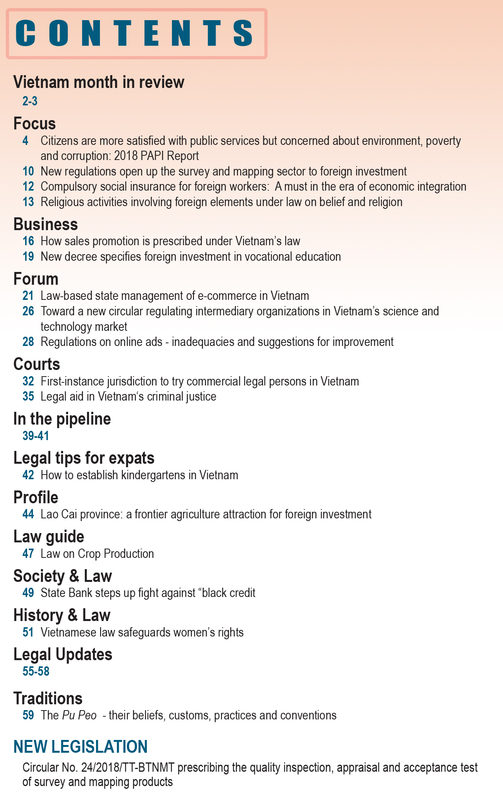 Head of the Cao Bang Economic Zone Management Board Nguyen Kien Cuong told Vietnam Law and Legal Forum that FDI attraction still focused on light industry, trade and warehousing, adding that the province has so far had no FDI projects in culture, healthcare and education. In order to become an attractive destination for domestic and foreign investors, the province has effectively implemented a scheme to raise the provincial competitiveness index (PCI) in the 2017-2020 period. The province jumped five spots to 58th position (among 63 ranked localities nationwide) in the 2017 PCI ranking with the highest points recorded in three of 10 sub-indices: business support services, labor training and entry costs for new firms. With the motto “The management board always stands side by side with enterprises and enterprises’ success is the management board’s success”, the provincial authorities have pledged to further assist licensed projects, step up the simplification of administrative formalities in investment, land and construction and remove difficulties and obstacles for investors. In addition to the Government-provided preferential treatment, the provincial administration has offered investors numerous incentives. Investors are exempted from land rental for 11 years. Investment projects in the sectors eligible for special investment incentives do not have to pay land rental for 15 years. Non-commercial projects to build workers’ accommodations will enjoy land rental exemption as soon as they commence operation. Regarding taxation, business projects are entitled to corporate income tax exemption for four years since the generation of taxable income and a 50-percent tax reduction for subsequent nine years. Projects that invest in building new production lines, expanding production scale, innovating technologies, raising production capacity or improving biological environment are entitled to value-added tax exemption for up to four years and 50-percent tax reduction for subsequent five to seven years. The province is planning to organize the 2018 investment, trade and tourism promotion conference on November 24 in the provincial city. It hopes to promote its image and introduce its potential and advantages, as well as fields calling for investment. It expects to lure more quality FDI projects in potential fields such as border trade and tourism. With beautiful mountain landscapes, sparkling terraced rice fields and ethnic villages, Cao Bang has been named among top five unique treks in Southeast Asia by Singapore’s Skyscanner website. The province is well-known for the UNESCO-recognized Non Nuoc Cao Bang Geopark with a number of famous cultural and historical relics, including the Ban Gioc waterfalls - one of the most beautiful waterfalls in the country, the special national historical site of Pac Bo cave where late President Ho Chi Minh used to live and work during the resistance war against the French colonialists, Lenin stream, Thang Hen lake, Ky Rang cave and Phja Oac-Phja Den national park. Cao Bang province is also famous for black-jelly plants that are used to make grass jelly, a specialty of Thach An district. Cao Bang is renowned for the traditional “Then” singing - an unique art of the Tay and Nung ethnic groups, and a number of festivals that attract not only domestic but also foreign tourists. They are the Nang Hai festival, a traditional one of the Tay ethnic group in which they pray for favorable weather, bumper crops and a happy life; the Long Tong (going to the field) festival of the Tay ethnic group; and Ky Sam Temple, King Le Temple and Da Quan Pagoda festivals. 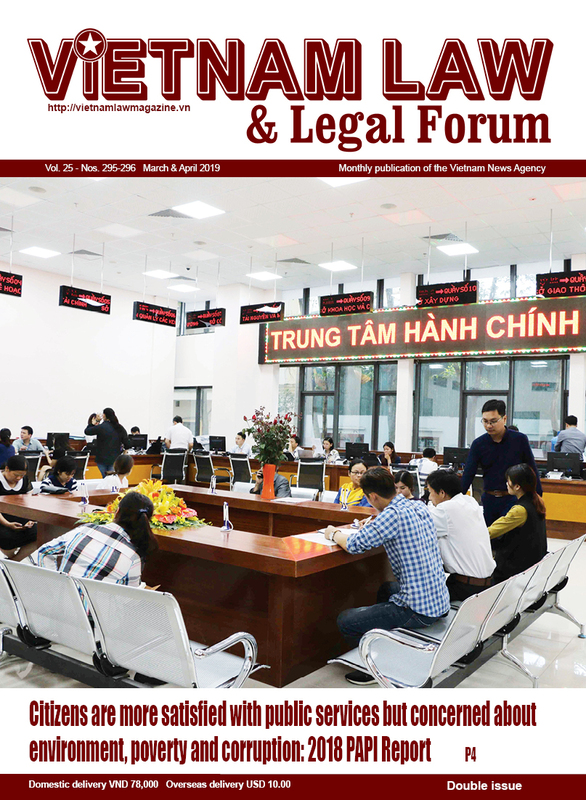 Head of the Cao Bang Culture, Sports and Tourism Department’s tourism management section Nong Thi Tuyen told Vietnam Law and Legal Forum that the province welcomed 923,730 tourists in the first nine months of this year, including some 79,000 foreigners, and earned a turnover of VND 251 billion. 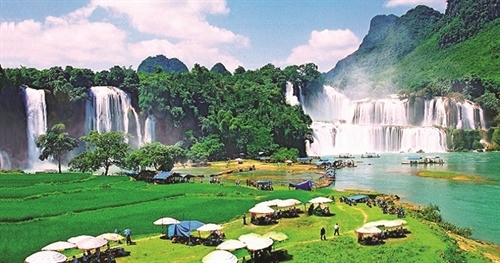 In order to introduce tourist destinations, special tours and local ethnic groups’ cultural features, provincial People’s Committee chairman Hoang Xuan Anh said that the province would publish a travel book entitled “Bac Gioc waterfalls - a marvel of nature” in both Vietnamese and English next month. Prior to the 2018 investment, trade and tourism promotion conference, a video clip named “Cao Bang - a fairy land” and a documentary themed “Cao Bang - prospects for investment, cooperation and development” are expected to be shown on central and local televisions. 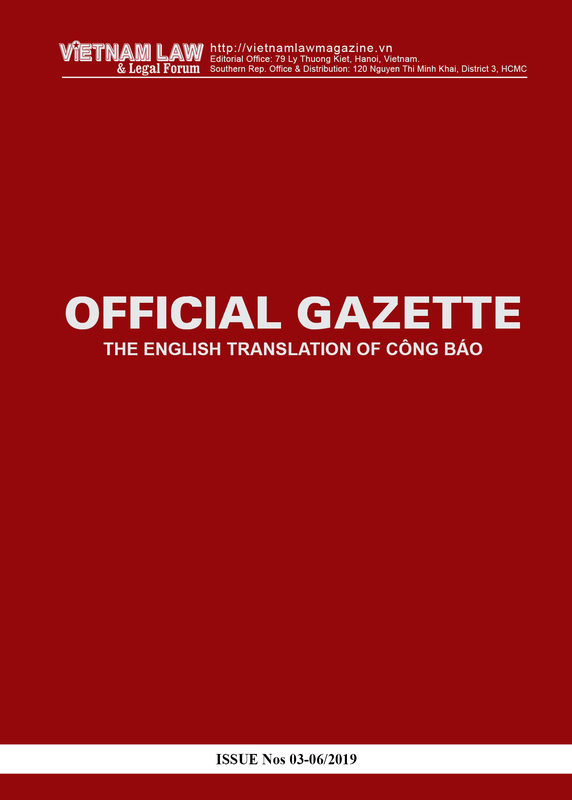 The provincial authorities have also planned to organize a ceremony to celebrate UNESCO’s recognition of the Non Nuoc Cao Bang Geopark as a global geopark, announce the historical site of the 1950 border campaign victory in Thach An district as a national relic and a tourism program themed “Through Viet Bac heritage sites” on November 24-27.